Recording actions is the simplest way to add actions into the designer to build a FMiner project, check the record button on the toolbar to begin record macro, and uncheck the button to stop it. When recording, all the human's actions(e.g click, fill...) will be add to the designer, and some special actions need right click the elements on the page and select an option in the context menu. NOTE: When You record actions(click or right-click on page), you must make sure the page finished loading(the icon of the browser become all blue). Right-click an element on the page, the valid actions will be shown in the menu, click one to add it. 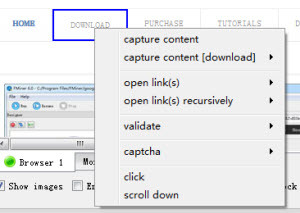 When the DOM clicked is a link, "open links" and "open links recursively" options will be valid on the menu. You can use this action feature to operate on any in-page control element such as text input field, checkbox options, radio selectors toggles or drop-down menu selectors much as you would by using your mouse and keyboard in a browser. For "fill" action, you can select a "table data" or "variable" for inputting. When you select some text on the page, you can add a "validate" action to validate failing text or successful text. Alternatively you can just validate whether the target text or element is found. 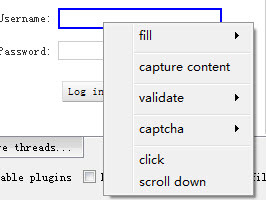 Add a captcha get or captcha input action. Add scrape page action, if the select diagram is "scrape page" action, capture content option will be valid to add in the diagram.